Are you looking for help selling your home? Well, let the Team Hinton Real Estate Group be your personal resource for everything having to do with selling a home successfully! Download the FREE Team Hinton Seasonal Seller's Guide and get started selling your home TODAY! Thank you for your interest in our Seller's Guide! You're moments away from getting a lot more information about selling your home. Your download is available now. Please call, text or email if you have any questions! Looking to buy a home once you sell? Get market information in our Free Buyer's Guide. Are you looking for information that helps you truly understand what it means to be a SELLER in TODAY"S MARKET? 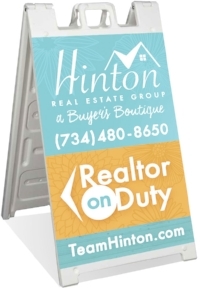 Let the Team Hinton Real Estate Group help guide you to a successful sale! We can be your partner, ready with everything you need from an expecting family looking for an upgrade, to an Empty Nester looking to downsize their living space. We will give you the tools and resources you need, like our FREE Seller's Guide! Get more guidance with the Mortgage Process and help you determine what it takes to purchase a home. WE BELIEVE YOU ARE THE NUMBER ONE PRIORITY IN OUR OFFICE. CALL US TODAY TO SCHEDULE A FREE CONSULTATION TODAY! Visit our Downtown Ypsi Office for your FREE Sellers Kit! We always love to have visitors! Stop by the Hinton Real Estate Group Office in Downtown Ypsilanti at the corner of Washington & Pearl to pick up your FREE Seller's Kit! For more detailed directions our address is 36 N. Washington St. Ypsilanti, MI 48197.